Chameleon fanciers are indeed fortunate that the chameleon best suited for captivity, the veiled or concave-casqued chameleon (Chamaeleo calyptratus) is also among the most beautiful and interesting of the group (it is also pathologically anti-social, but so are most of its relatives!). Turquoise, emerald green, yellow and tan, each in many shades, all find a place in this lizard’s repertoire of color changes. 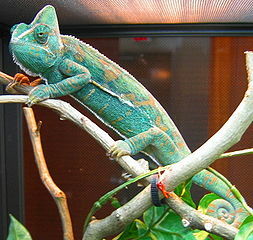 Male veiled chameleons approach 2 feet in length while females top out at about 14 inches. The bony, 3-4 inch high casque (helmet-like structure) that crowns the male’s head gives the species its alternative name of “concave-casqued chameleon”. The casque of the female is much smaller. In addition to conferring the impression of greater size upon its owner – an important consideration in territorial disputes – the casque functions as a water condensation surface. Water gathering on the casque is funneled to the chameleon’s mouth by movable skin flaps, aiding survival in the dry habitats in which this species dwells. Ample space and ventilation are key in successfully keeping veiled chameleons. Weather permitting, heavily-planted outdoor cages are the ultimate in chameleon homes. Our outdoor aviaries are perfect …housing chameleons in this manner also offers the best chance of breeding success. Our large screen cages and terrarium top add-ons are ideal for indoor maintenance. Dietary variety is an absolute must when it comes to keeping even the hardiest of chameleons, and the veiled is no exception. A diet restricted to crickets and mealworms will lead to your pet’s early demise. The main portion of their diet should be comprised of roaches, crickets, mealworm beetles, super mealworms, butterworms, waxworms, silkworms and tomato hornworms (these last two now available via internet dealers). Veiled chameleons also readily accept canned insects from plastic feeding tongs. Grasshoppers, silkworms and others should be used frequently to increase dietary variety. All chameleons become “nutritionally bored” over time, and most eventually refuse once-favored foods that are offered continually. With that in mind, I consider wild-caught insects, collected from pesticide-free areas, to be an essential element of chameleon husbandry. Zoo Med’s Bug Napper is an excellent insect trap. Sweeping a net through tall grass and searching around outdoor lights will also yield a wide variety of tasty treats…katydids, grasshoppers, cicadas, moths, butterflies, beetles, caterpillars and other insects will all be eagerly accepted. Food insects should themselves be given a nutritious diet before being offered to your pets. Please see my article Prepared Diets and Food Supplements for House Crickets for further information. Leaves and Flowers….for a chameleon? Oddly for a species belonging to a family of such highly-evolved predators, the veiled chameleon consumes a good deal of vegetation. Favored plant foods include dandelion (flowers and leaves), Ficus, romaine and the flowers of Nasturtium and Hibiscus. Adults fed a varied diet require a vitamin/mineral supplement once or twice weekly; the food of growing chameleons should be supplemented 3-4 times each week. An interesting article on feral veiled chameleons in Florida is posted at http://www.naherpetology.org/pdf_files/208.pdf. Good questions, glad you brought them up. Super mealworms, despite being larger than the unrelated “regular” mealworm (Tenebrio molitor) are actually lower in indigestible chitin and so are better in that sense. Also, they have very wide appetites, and hence are easy to “nutrient load”, making them a potentially valuable food item. Its best to keep a colony going so that they are feeding on a nutritious diet before being themselves used as food…using direct from the store is usually not a good idea. Keep the grubs in a mix of Staple Diet Fish Flakes, Insect Gutload Powder, whole grain dry baby (“human baby”!) cereal and oat or corn meal, along with some banana skins, orange, carrots etc. for moisture (watch for mold). They should be allowed to feed for 2 days at least, but preferably longer. Room temperatures are fine, but metabolism speeds up as temperatures rise. Newly molted (white in color) grubs are best, but they do not molt as frequently as Tenebrio. Use super mealworms as only part of a varied diet…as mentioned in the article, wild caught and canned insects are extremely important for veiled and other chameleons. Regarding removing the grubs’ heads – chameleons masticate their prey well…not “chewing” as we know it, but insects are generally killed in the process, and their digestive enzymes are extremely powerful. I’ve never had any problems concerning damage to the chameleon, but would be sure to use appropriately sized insects and not to feed super mealworms to debilitated animals, which might not kill or digest them. Damage from a mealworm’s mouthparts might be more likely with frogs, which tend to take food down while still alive, and then only with animals in digestive distress (the enzymes kill most anything right away…cicadas swallowed by American bullfrogs stop buzzing in about 2 seconds, in my experience). A more likely potential problem area would be with large mealworms fed to small animals, or force fed to sick individuals. It is also important not to leave them at large in some situations, as they have carnivorous tendencies and will attack sick or chilled reptiles. I do not feed super mealworms to amphibians other than bullfrogs, Blomberg’s and marine toads and other robust species, but use them for many chameleons and other lizards. i have green mold on my lizards eggs.what does this mean.what can i do to get rid of it? Mold usually indicates that the incubation medium is too moist and/or that the eggs are not fertile or have ceased to develop. If you’d like to provide details as to how they were set up, I may be able to offer some advice re the next batch of eggs. The eggs are most likely not viable; try looking at them against a bright light, to see if any blood vessels are visible. If so, you might try some methylene blue (1 drop dissolved in 2 oz. water) on the egg shells (use gloves, as it stains skin) but in all likely the eggs unfortunately will not hatch. i’m looking to buy my first chameleon. what species would be good to start with? Hello Jason, Frank Indiviglio here. Thanks for your interest in our blog. I would say a Veiled Chameleon for sure. Assuming you can provide enough space and a good diet, they can be quite hardy. Definitely not an animal to handle, however. My husband and I recently purchased a vieled chameleon. Hes about 5-6 inches inc. his tail. Hes currently getting 6-10 guttloaded medium sized crickets. Another question I have is if he is too small for waxworms or other feeders yet? Hello CJ, Frank Indiviglio here. A vitamin supplement should be added to the diet along with the calcium; Reptivite with D3 is a good choice. We do not yet understand their specific needs, but some general rules have emerged based on experience. If the diet is limited to 3-4 species of feeder insects, and considering that the lizard s young, use supplements 4-5 times weekly, alternating between the 2 types. You can reduce somewhat if wild-caught insects are used (please write in with details). Please remember that without UVB light, the lizard will not be able to metabolize the calcium it consumes. Waxworms and other insects are useful; waxworms are high in chitin and may be hard to digest, so use only 2-3 grubs every few days; same for small Super Mealworms. Regular mealworms are best kept as a colony – use newly shed (white) grubs or beetles. I’ve noticed him trying to eat his fake plants and I know vieleds like plants for the moisture – So other than the dandelion/romain etc you have listed above are there any other fruits and veggies he might like? We’ve had him about 3 weeks now and when we brought him home he was just finishing shedding (justa few pieces of dead skin) … I came home from work today to find him shedding again… Is this normal? Thanks, and please don’t hesitate to write in. We have much to learn about chameleons, so every exchange is useful to both myself and other readers. I often ideas generated here with herpetologist colleagues as well. Almost any available greens can be tried, other than spinach/cabbage which has been implicated in excretory system stones in some species. Avoid fruit, as they likely do not encounter this in the wild and may not be able to digest it properly. Unlike snakes, lizards shed piecemeal, sometimes over a few days. They may also eat some or all of the skin. Spray him a bit more than usual during shedding and check that no skin remains on the toes or tail tip after a few days. Growing animals fed heavily do shed often, but complete sheds one after another, over a 2 week or so period, can indicate mites or other problems. Hi. We purchased our veiled about 3 months ago. He is doing awesome! I do have a question about socialization. Would it be a bad idea to socialize him a little? I have read some articles that are pretty insistent in saying that they are antisocial animals. I dont intend to have a “Pet My Chameleon” party, but I dont want to traumatize him either. We have taken him outside a few times ie., to the store or the front yard. What is your opinion? Thanks for your time! Hello Alba, Frank Indiviglio here. Thanks for the interesting and important question. It’s a bad idea to handle chameleons unless necessary. Unfortunately, many will not show outward signs of stress, but internally stress hormones will be wrecking havoc on the immune system. This is one of the primary reasons why even well-habituated captives do not live as long as they otherwise might in captivity, die suddenly “for no apparent reason” and rarely reproduce. The animal will receive absolutely no benefit at all from human contact or a change in scenery. Outdoor exposure to sunlight is beneficial, but in a secure screen cage, not in the hand or perched on a shoulder. Please consider your lizard as a pet to observe only. my veiled chameleon is about 9 months now and he is all of a sudden sleeping in the day. Not moving for several ours and looks very ill. i dont know if its MBD or what ive looked things up but i just cant figure it out. Unfortunately, sleeping and lethargy are symptoms of a wide range of health problems, so it is not possible to diagnose based on that. You’ll need to bring the lizard to an experienced reptile vet – the sooner the better; please let me know if you need help in locating a nearby vet practice that treats reptiles. In the meantime, please send me some details concerning diet, UVB exposure, heat, cage set-up and so on, so that I can get a better idea of the animal’s background. This article on Chameleon Care is general in nature, but may be helpful in highlighting different factors to be aware of. I follow all instructions that you identify in this article but my chameleon always seems to squint it’s’ eyes. Any ideas? Hi Frank. I bought a veiled chameleon 2 days ago after my previous chameleons passing a few months ago. He is shy to eating right now, but I know stress from the move can easily cause them to be uninterested. Although, I am concerned about what I should and should not be feeding him since he is young. The one before I believe ate a piece of bark so I am trying to feed this one crickets from a cup (the pet store manager recommended it). 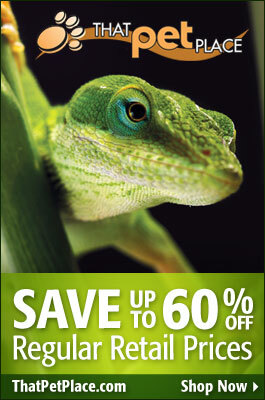 I have Exo terra calcium without d3 for the younger chameleon and exo terra multivitamin as well. How often should I use them, and what kind of other insects, if any, should I be giving him since he is young? (I also have repti calcium with d3 and rep-cal herptivite but I do not use them). Provide as much variety as possible..please see the articles linked below for some ideas. Calciworms and lab-reared houseflies (may not be mentioned in article) can also be ordered online.